Life is hard. Then there's triathlon. From the Greek for "three contests" triathlon competitions test the endurance of only the most fit athletes ready to take on the triple challenge of swimming, cycling, and running. And if you think that sounds challenging, the very first triathlon competitions ever recorded were staged without a break in between (unheard of in modern competition) when "le trois sports" were first staged in the 1920's in France. In the modern era, the first triathlon in America .took place in San Diego in 1974. That event was quickly followed by the famous introduction of the "Ironman" competition in Hawaii that brought the sport a step further with a test of muscle-burning endurance. 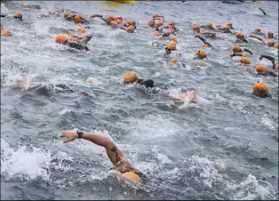 Featuring a swim in rough Pacific surf followed by a 100-mile bike race, the first Ironman competition lasted for almost 12 hours before ending in a grueling 26.2 mile marathon. A natural for international competition, the sport first entered the world stage with the very first Olympic triathlon competition in 2000 at Sydney. More recently, triathlon competitions have been discovered by fitness buffs. Some of these amateurs, who begin triathlon training merely to tone up, quickly become addicted to the sport that offers incredible physical challenges along with an emotional jubilation that beats out any "runners high." Beginner Triathlete.com - Basic training for the triathelete newbie including tips on training and nutrition, gear reviews, story articles and busy online forum. Ironman Live - With news from around the world combined with training tips and tons of articles, this Ironman Triathlon site should be on your training schedule whether you are planning on competing in Kona or not. Triathlon Canada - Follow the triathletes from Team Canada and get the latest information on all Canadian triathlon competitions at this national site with information available both in English and French. Triathlete - This online magazine features the latest news on competitions and competitors. It also has regular columns on the nutrition concerns of triathletes, a very complete calendar of upcoming events and much more in the way of resources for this sport.